Permanent Painted Coatings is the importer and distributor of POR-15 Concrete Floor Armor Kits. 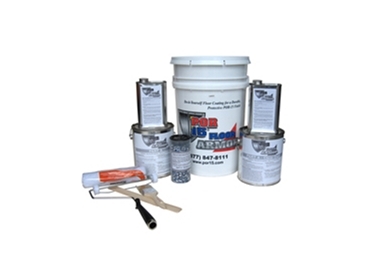 Floors can now be permanently sealed with POR-15 Floor Armor painting kits that will save time and money. POR-15 painting kits have an easy degreaser that can be used on any heavy oil or grease stains. Surfaces should be vacuumed to remove dust or dirt and then paint right over everything with Floor Armor. Floor Armor paints can be used in heavy traffic areas and can withstand forklifts, floor jacks and constant traffic. Once a concrete floor is covered with Floor Armor, oil and grease stains can be wiped up with a rag while keeping dust to a minimum. Floor Armour paints are available in light grey, dark grey, tan, beige and white colours. Permanent Painted Coating also offer the Deluxe Kit which includes all items in the basic kit plus a Clear Coat Kit top coat that contains everything required, including decorative vinyl chips that can hide imperfections.